A while back I read and very much enjoyed Marko Kloos's debut novel TERMS OF ENLISTMENT. It's a top-notch military science fiction novel narrated by young soldier Andrew Grayson, which ends with a cliffhanger of sorts as humanity makes contact with an alien race for the first time and realizes that to those aliens, humanity is nothing more than a bunch of ants to be stepped on. As the sequel, LINES OF DEPARTURE, opens, five years have passed since the ending of the first novel, and Andrew has become a seasoned veteran of the war against the aliens, who have come to be called the Lankies. (I'm not quite sure why.) The Earth forces have lost basically every battle, and the Lankies have gobbled up human colony after human colony. Not only that, the two main Terran factions are still fighting amongst themselves, as they were before the aliens showed up, and the situation on Earth itself is steadily deteriorating, as Andrew discovers when he makes a poignant trip home to visit his mother. 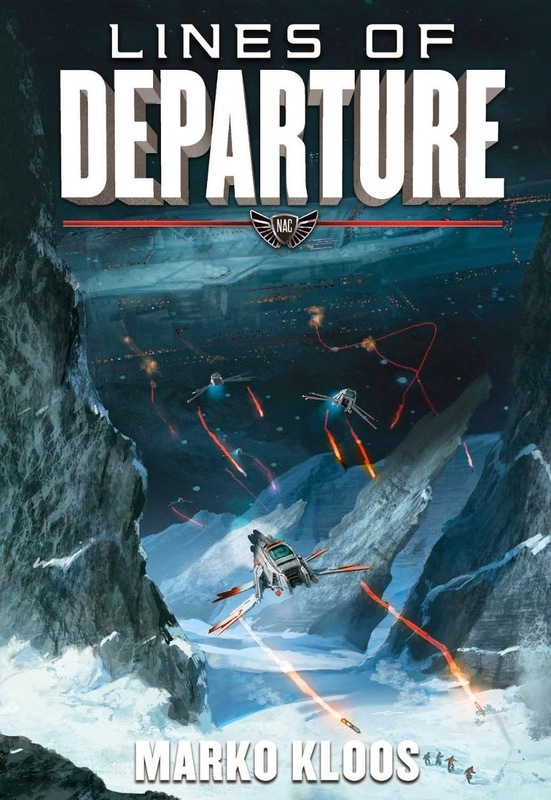 Like the first book in the series, LINES OF DEPARTURE has a high degree of authenticity when it comes to the military activity, and the action scenes, which include both ground combat and space battles, are very well-handled. In addition, Andrew is a fine, sympathetic protagonist, tough, intelligent, and very human. I thought this book got off to a little slower start and wasn't quite as compelling overall as TERMS OF ENLISTMENT, but it's still an absolutely top-notch science fiction novel. And although it certainly has a satisfying climax, it ends on something of a cliffhanger as well. The third book in the trilogy, ANGLES OF ATTACK, is already available, and I'll be picking it up and reading it soon. I first heard of this one via the minor dust up that is this year's Hugo Award nominations. I didn't realize it was a sequel. I may have to check them out. As a former ad-man (remember ads?) and paperback hack-writer (remember paperbacks?) I speak from experience when I say that Brad Torgensen and some of his more well-meaning associates may simply be suffering from S.O.M.S. -- Sad Old Man Syndrome. As a sixty-something (as of this month) I can affirm that the world does, indeed, change -- and in most cases faster than most people do. There are no more local/regional and few remaining national magazines and newspapers for me to design ads for. Radio is pretty much dead as an advertising medium -- and radio ads were my specialty, on a local/regional level, and provided me a very comfortable income for several decades. And the days of ad-men drawing supplemental income from pounding out cheap "pulp" fiction for countless competing paperback publishers at a thousand dollars a pop (in today's money) are long gone. And those of us who, in the past, found niches in as well-paid "experts" are finding our niches either fading or vanished. I am reminded of the "expert" frontier stagecoach driver in Old Western fiction who complains about how railroad expansion has made his profession obsolete... and made him have to find work "sweepin' floors in a dang ol' dry goods store!" Today's few remaining expert typewriter repairmen might share his sentiments. But spitefully kicking a locomotive engine in the cow-catcher or protesting electronic word-processing at the local computer store are about as effective in stopping "progress" as trying to stop time by hacking the slate of nominees at the Hugo Awards. But be advised: Live long enough... and you'll come down with it yourself. See ya' down at the dry goods store. I'll save ya' a broom. So it's already been made clear this review hopped right into the Hugo debacle, sorry James. He withdrew his nomination for this book because of the toxicity of the situation. This one sounds...good but not great. We'll have to agree to disagree on the causes of the Hugo dust-up. I don't think anybody on the Puppy side of the argument qualifies as aging (except maybe Mike Resnick). All the others seem like kids to an old geezer like me. I'd already read this book and written my review of it a while ago, then promptly forgot to schedule it. (That business of being a geezer again...) I don't mind any discussion of the Hugo fuss here, as long as anybody who wants to comment is civil about it. If you've followed any of the discussion in other places, you know that civility is often in short supply. As for me, my interest is much more in the books than the controversy, and as someone who had pretty much stopped reading current SF, I've been happy to discover over the past couple of years that there are still books being written that I like, many of them either self-published or from the small presses. I'm a supporting member of Worldcon and intend to vote, so there'll be more reviews of the nominated stuff coming up. Good but not great is an apt description of this one. I liked it and thought it deserved its nomination, but chances are I wouldn't have voted for it to win if it had remained in contention.